Bishops Lydeard Station first welcomed passengers in 1862 when the line from Norton Fitzwarren to Watchet was opened. Until closure by British Railways, it was a typical village station part way along a branch line. For a few years after re-opening in 1979, very little changed to the fabric of the station - the canopy was rebuilt and the goods shed extended a little. But with the station, being the southern terminus of the railway, the passengers starting their journeys at Bishops Lydeard began to increase dramatically - the daily figures in summer probably greater than several months worth in the old days! First, a new ticket office and then a shop was constructed on the "up" platform which itself has been much lengthened to accommodate the longest trains, and, with the development of the area to the east, a new car park and toilet block constructed. 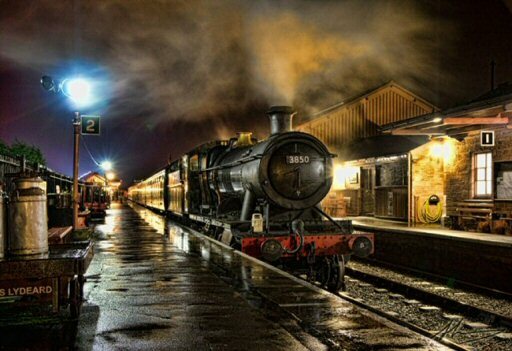 The station is the headquarters of the West Somerset Railway Association. The Quantock Belle dining car train is also based here. A locomotive servicing depot is situated at Westridge at the Taunton end of the Station, which also marks the top of a steep climb from the Vale of Taunton Deane. The old goods shed, used in the recent past for storage and carriage restoration, is now splendidly restored as a visitor centre - the Gauge Museum - with large and small exhibits and a model railway. The Friends of Bishops Lydeard Station supports the station.